My head and my heart are somewhat in a whir! I have just returned from an amazing trip to South Africa with my kids. It was a time to explore my roots and the changes that have taken place since I left 31 years ago. Before going I decided to record my experiences, feelings and the energy of the places with marks on paper. I packed my watercolours, charcoal, pencils and pens, hoping this was not in vain. The landscape of the Cape moved me deeply. I felt a sense of wonder and exhilaration at the dramatic rise of the mountains from the sea. Although I had previously understood the influence of my childhood relationship with nature on my art making, being there again prompted a more profound knowing of this truth. And so I sketched and painted almost everyday – sometimes 3 or 4 works in a sitting – and I returned to my studio with a portfolio filled with images, sensations and ideas to explore. I also returned with a renewed passion for working ‘en plein air’, that is, directly from the landscape. Drawing outdoors invites a sensitivity of touch and perception that can be lost in the studio. The subtle vibrations of the place, the shifting weather, the time of day… all these factors affect the process and the result. Not only that, but you may notice in the images below how different materials evoke distinct moods. Each imparts a unique quality and requires me to look at the landscape through a different lens. 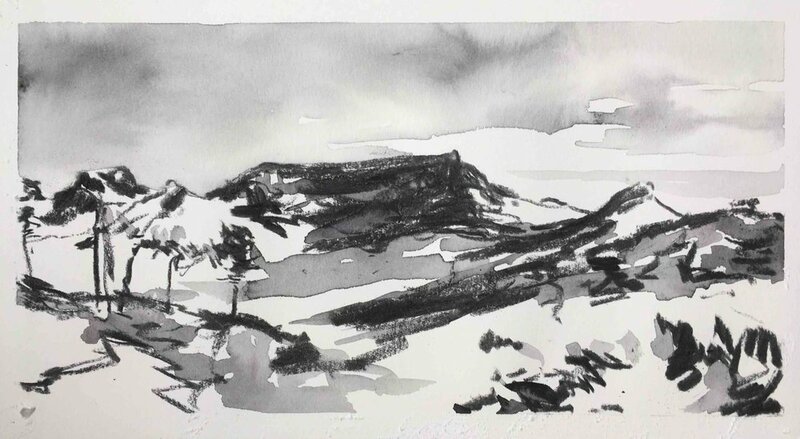 As I pick up a brush or a stick of charcoal I need to account for the potential and the limitations of its marks and in a mysterious way, search out resonant forms in my subject to depict. This is a fascinating enigma! Perhaps my story piques your curiosity or reminds you of similar experiences you’ve had? 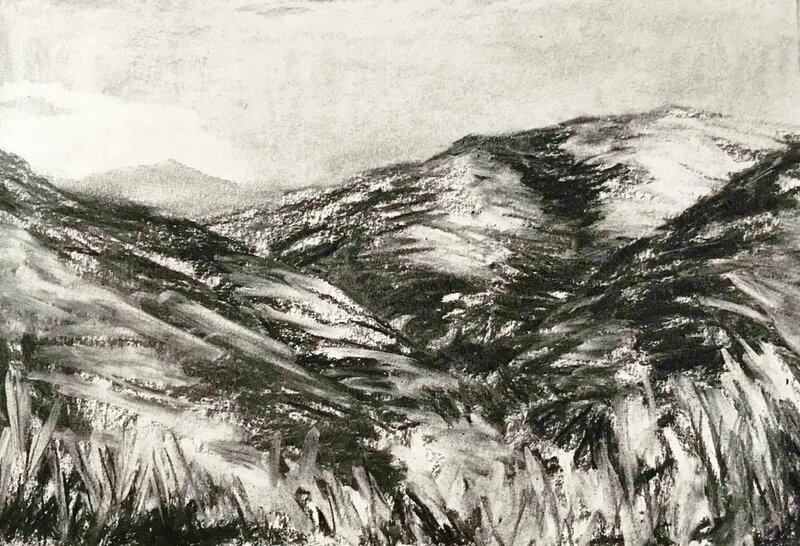 Maybe you feel inspired to sketch or paint in the landscape? If so, I invite you to join me for a two day ‘en plein air’ sketching and painting workshop, 24 - 25 February, in Glenbrook, only an hour from Sydney in the Lower Blue Mountains. I will share my approach to art making and passion for landscape with you and encourage you to explore using various techniques and materials to create your own unique artworks. Check out the details on my website by clicking on this link, Painting the Sky and Atmospheric Landscapes. I look forward to hearing from you, whether to book into the workshop, or to tell me a story of your own.